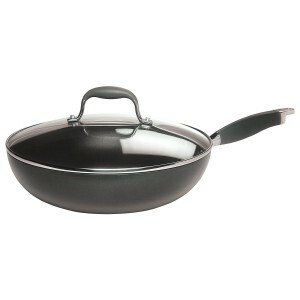 Hard anodized aluminum cookware has become increasingly popular in recent years. It’s no wonder, really, as the cookware is affordable, durable and easy to clean. If you’re shopping for a new set of cookware, you may be considering hard anodized pots and pans. Here is a brief overview of what hard anodized cookware is, and some of the benefits you’ll find when using it. Hard anodized cookware is almost always made out of aluminum. Aluminum has been used in cookware for years because it’s an excellent conductor of heat. In fact, in most stainless steel pots and pans, aluminum is encapsulated between layers of steel because it’s a far better heat conductor than just the stainless steel alone. To create hard anodized cookware, the aluminum is treated with an electrochemical process. The metal is treated chemically with sulfuric acid and then exposed to an electrical current. This process leaves the surface very hard and durable. The surface also becomes non-porous and, therefore, non-stick. The anodizing process leaves the aluminum very strong, and in fact, hard anodized cookware is up to 30% stronger than stainless steel pots and pans. While the anodizing process leaves a non-porous, non-stick finish on the pan, sometimes hard anodized cookware is also treated with an additional non-stick coating. When comparing hard anodized cookware to other types, particularly stainless steel, hard anodized pots and pans are considerably less expensive. Because of the anodizing process, they also tend to be lighter in weight than their stainless steel counterparts. Hard anodized cookware is incredibly durable, thanks to the electrochemical process that the aluminum goes through. In fact, hard anodized cookware is twice as hard as steel and therefore, will hold up longer. Of course, this does in part depend on how well the cookware is cared for. Anodized aluminum conducts heat exceptionally well. This means that pots and pans heat up quickly and evenly. There is less chance of developing “hot spots” during cooking. Also, because the heat is distributed evenly, food will cook more evenly. Obviously, non stick cookware is going to be incredibly easy to clean. In better cookware, you’ll find that food literally slides right off of the surface of the pots and pans. You can literally swab them with a paper towel and get most of the food off. Unfortunately, it isn’t a really good idea to put your hard anodized cookware in the dishwasher. Dishwasher soap tends to be pretty abrasive, and this can lead to a breakdown of the surface of the cookware. Who Is Hard Anodized Cookware Best For? Hard anodized cookware is a good all around choice for home cooks. In particular, for those starting out with their first cookware, or someone wanting to buy a quality set of pots and pans that isn’t going to cost them an arm and a leg. Of course, as with anything you buy, you get what you pay for. There are certainly higher quality sets, and lower quality ones, too. It is possible, however, to find a good quality hard anodized set for under $150.